“Leader pins” belonging to Tibetan delegates at the Two Congresses. Image shared widely on social media. China's top legislative and consultative bodies, the National People's Congress and Chinese People's Political Consultative Conference, began their week-long deliberations on national policies this Saturday, March 5. Under the country's political system, the Communist Party alone represents the Chinese people, and the parliament largely rubber-stamps any decisions made by the party's Politburo Standing Committee. With little opportunity for direct political participation, Chinese Internet users make sport of dissecting and often mocking statements by legislators at the annual conference. This year, attention is focused on pins bearing Chinese President Xi Jinping's image that appeared on the chests of Tibetan delegates. Many Internet users say the pins remind them of the leader-worship culture that plagued China during the Cultural Revolution, from 1966 until 1976, when Mao Zedong attempted to consolidate his power and sideline “revisionists” within the party. 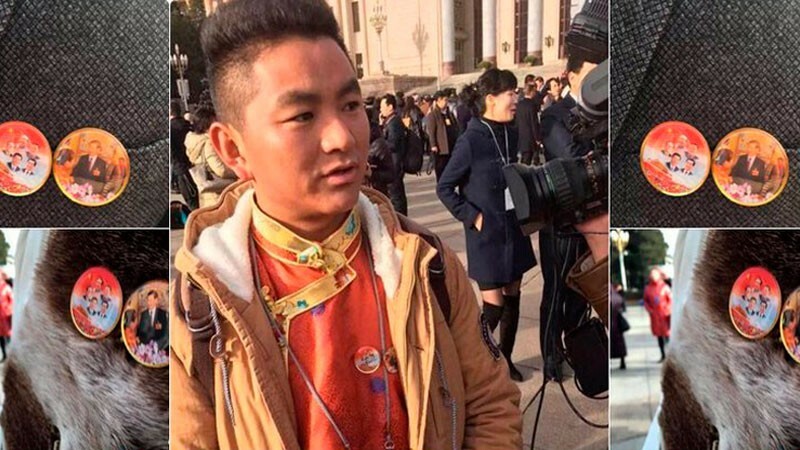 Qin Feng, a reporter for Hong Kong Star TV, spotted the Tibetan delegates wearing two pins on their chests when they were entering Congress Hall. One of the pins featured the images of Mao Zedong, Deng Xiaoping, Jiang Zeming, Hu Jintao, and Xi Jinping. The other showed only Xi Jinping. The Tibetan delegation was the only one wearing such items. Qin Feng uploaded the photos to her public account on WeChat, where they soon spread to other social media platforms, becoming a viral sensation within a few hours. Before long, the reporter's WeChat account was blocked and the term “Xi's pin” became unsearchable on Sina Weibo. @”Bei-Wai-Qiao-Mu”: Tibetan delegates and their staff members were asked to wear the pins. Such practice should be promoted across the country. Such Chinese national tradition has been missing in the past three decades and we should not let North Korea enjoy all the spotlight. @”Ba-chu yu-qiao”: They should hook the pins on their flesh to express their loyalty. The one with five icons is too dispersed and against the principle of upholding the core. During the Cultural Revolution, no such kind of pins can be distributed. @”Searching for flower in dream”: Yes, the iconic images should be hung up at Tiananmen Square. @”Fire rock”: the liberated serfs [Tibetan were liberated from slavery system by the People Liberation Army in 1950s according to China's history book] wear two pins on their chests. One has Mao Zedong, Deng Xiaoping, Jiang Zeming, Hu Jintao [and Xi JInping] and the other one has Xi only. Are they saying that Xi is greatest among all leaders? @Jia Jia: watching what happens in mainland China, the culture of Big-character poster and big criticism have returned. Now the pins have returned to show loyalty. I feel lucky [that he has left the country]. I am also thankful to my friends and the books that I have read, all these have helped me to remain a normal person and live up to some fundamental principles.